A faint glimpse of another Rhynie chert plant ? Up to now, 7 species of "higher plants" have been discovered in the Lower Devonian Rhynie chert, every one with its own distinctive features. None of them has been found elsewhere. The latest ones, members of the larger zosterophyll family thought to be related to the ancestors of the clubmosses, were published in 1991  and 2000 . So it is worth while looking for more. Photograph and drawing: Sporangium attached to a poorly preserved shoot with tiny thorns (above left), apparently not fitting to any known species in the Rhynie chert. Another zosterophyll ? Width of the picture 2.4mm. 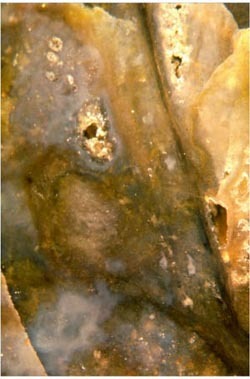 A chert sample found in 2006 shows a faint structure which does not seem to fit to any of the known species. A small bud-like sporangium is seen attached sideways above a slight kink of the shoot (below right). 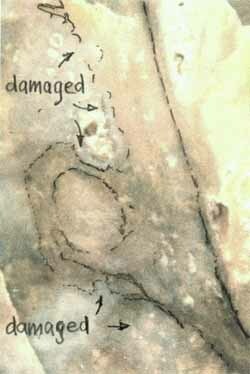 Unfortunately, the preservation is poor, and the shoot seems to be partially damaged or sqeezed. Also it is difficult to distinguish between the plant remains and microbial coatings on them. What seems to be a sturdy bristle might serve as an argument for an affinity to the zosterophylls. There are smaller bristles on the shoot (not seen here) but no needle-shaped ones, which seems to preclude an interpretation as Trichopherophyton, the only plant in the chert known to bear bristles. The shoot with sideways attached sporangium resembles fragments of Salopella . The apparent scarcity of fossil remains of this plant could be due to fast decay, similar as with Trichopherophyton, which likewise had been overlooked for a long time. Careful inspection of chert samples with poorly preserved plant parts could possibly confirm the status of this elusive plant as a new species in the Rhynie chert, of which it is not known whether it represents an ecological niche with endemic species or a more extended Lower Devonian habitat. A.G.Lyon, D. Edwards: The first zosterophyll from the Lower Devonian Rhynie Chert. Trans. Roy. Soc. Edinburgh: Earth Sci. 82(1991), 323-332. D. Edwards, U. Fanning: Evolution and environment in the late Silurian – early Devonian: the rise of the pteridophytes. Phil. Trans. Roy. Soc. London B 309(1985), 147-165.